"Buy on the sound of cannons, sell on the sound of trumpets"
Easy to say, hard to do. It is far more comfortable to speak those words in a lecture hall than it is to execute on them during a civil war. And as we’ll see below, it is not always sage advice, especially in the case of currency trading. Fear is one of our oldest emotions. First we must nourish ourselves to live. Second we must avoid danger in order to survive. The biological fear response saturates our bodies and brains with hormones and neurotransmitters and throws our rational prefrontal cortex offline. In the midst of fear, our breathing, heart rate, circulation, muscle tone, digestion, and sensory interpretations all change. As our fear prepares us for fight, flight, or freezing, it creates an involuntary physiological response that we have little conscious control over. Fear turns our bodies into unthinking survival machines. I like the cannons in the opening quote because the fear that war and violence cause are significant to our predictive models for countries and currencies. It is difficult to measure expressions of fear in the news – reporters are trained not to express their own emotions. But they can report on the images and interviews that stir fear in them, and those interviews are usually around the topics of violence, chaos, and social breakdown. Last newsletter we introduced the idea of buying stocks in countries with the greatest government instability as reported in the news flow. In this newsletter we introduce a full model of global equity investing. 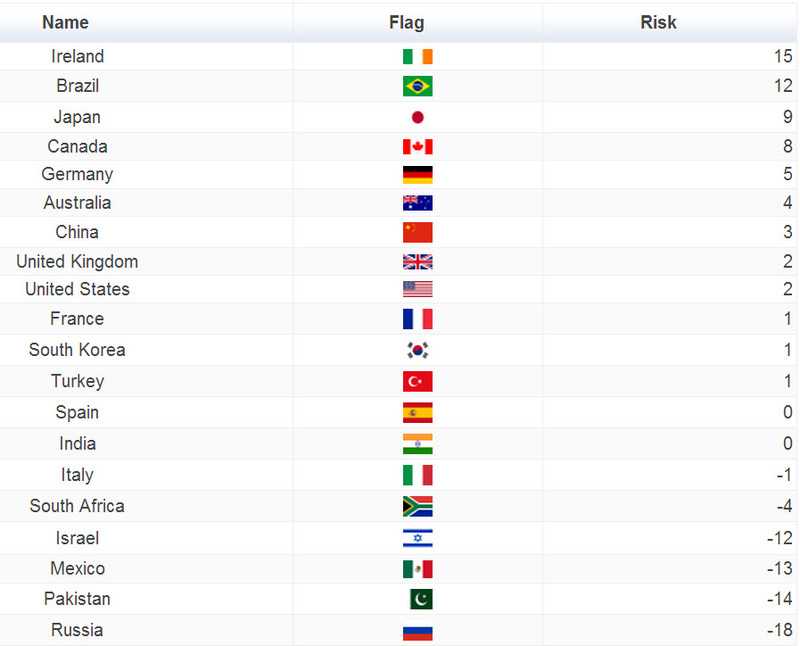 First we describe our automatically updating global investment risk map. Towards the end of the newsletter we identify the sentiments that are most influential over currency prices. We’ll be in San Francisco on February 13th for a company meeting. If you’re interested in learning more about our company, please get in touch. Last newsletter we profiled several sentiments that, when aggregated from the news flow about a country, appear predictive of future stock index returns in that country. We (and by “we” I mean Changjie Liu, MFE) did additional work on these variables. We found that all of the profits on the most impactful negative variables, such as GovermentInstability, come from long positions. However, the short positions significantly dampen volatility, especially during 2008. When we controlled for developing vs developed status of nations, their past stock index returns, and GDP, we found that most of the sentiment factors continued to demonstrate independent predictive power. Given such controls, we selected the most stable and top-performing Thomson Reuters MarketPsych Indices for a final model of global investment risk. This model was not generated via rigorous backtesting, because the averages are too long and the sample sizes too small. So please consider it with that caveat in mind. Using the above model we mapped the rankings using our data through January 2013. 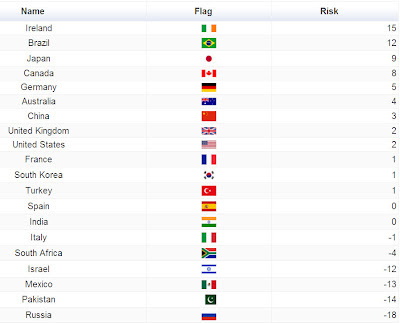 The result is below, followed by the list of countries and their rankings using our models. According to the model of the 20 most-discussed countries in the global news flow over the past 12 months, Russia and Mexico are predicted to have high-performing stock indexes in 2013. If a short offset is desired against the Mexico/Russia exposure, shorts on Ireland and Brazil could be placed. Keep in mind the shorts are for dampening volatility. We don’t see excess returns from the short side of the ranking. From our latest research into currencies, we are seeing two fear-based sentiments in the news flow driving currency returns: Uncertainty and Violence. The uncertainty reflects doubts about interest rates and monetary policy in the country of interest. The violence is related to war-like events that impact the currency price (wars, assaults, terrorism events, etc…). Using a study protocol similar to that we used for Countries – selecting the prior 12-month’s top 8 currencies by chatter volume (GBP, EUR, CHF, JPY, AUD, etc…) and then going long the top 2 and short the bottom 2, we see significant outperformance when arbitraging currencies based on Uncertainty and Violence. The U. S. Dollar was removed from this study, since it is the other side of all the currency pairs used. Uncertainty is fuel for fear, and in the case of uncertainty, investors should buy currencies with high uncertainty and go short those with low uncertainty. Importantly the case of violence is NOT contrarian. Investors should short currencies with high associated violence and buy those with low violence. Our currency research is ongoing, and we will likely develop a model in the same fashion as that we developed for countries. Our medium-term long on RIMM from November 4, 2012 should be closed out now. There was a classic Buy on the Rumor, Sell on the News price move around the Blackberry 10 release. This price pattern is a personal favorite of mine, and my 2002 academic paper on the topic is one of the few to examine its psychological origins. In any case, time to close out now with a 48% profit. Of our one-week trades from the January 5, 2013 newsletter: the short on TAN (solar ETF) lost 3% and Buy on Nike (NKE) gained 1%. Going forward, we have a one-week short on SWIR (Sierra Wireless Inc.) due to over-enthusiasm about a sale of their air card business. We have a one-week buy signal on 8x8 Inc. (EGHT) which is bouncing up from a recent selloff. (SEE DISCLAIMER BELOW). As noted above, we’re seeing a 12-month buys on the Russian and Mexican stock indexes. If a hedge is desired, Ireland and Brazil are the top candidates for off-setting short hedges. We have a number of Spring 2013 speaking engagements in New York, London, Toronto, Dallas, San Francisco and Boston – we look forward to seeing our friends in those cities! We’ve been so engrossed in our Country and Currency work that we’ve been remiss in announcing the top ranked companies for various sentiments in 2012. We plan to introduce those companies in the next newsletter.